EKO Lawn Top Dressing is a great medium for covering newly seeded lawns. EKO Lawn Top Dressing is a great medium for improving established lawns and revitalizing “pet spots” and compacted areas. EKO Lawn Top Dressing will improve the color, thickness and overall health of your turf. Amount to Apply: When used as a seed cover, apply EKO Lawn Top Dressing at a ½” depth after spreading grass seed, and water according to instructions on grass seed packaging. Amount to Apply: To achieve best results, aerate lawn before spreading. 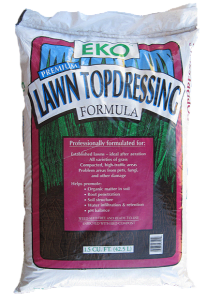 Apply EKO Lawn Top Dressing to your established lawn at a ½” depth. Rake EKO Lawn Top Dressing to a smooth, level covering. Water after spreading. All of the aforementioned is based upon using a high quality amendment that is incorporated into the top 6″ of your soil. When to Apply? : Apply EKO Lawn Top Dressing ideally after lawn aeration, but may be performed any time that the turf is free from snow and other debris. Applying EKO Lawn Top Dressing annually will provide your lawn with new vigor resulting in a thicker, greener, healthier lawn. You will notice a thicker lawn from improved root growth, as your soil becomes “renewed” with each application of EKO Lawn Top Dressing. EKO LAWN TOP DRESSING is derived from the finer screened materials from EKO Compost. You can expect the following results from use of this unique product. As you use it more, your results will be better. Improved soil structure – Organic matter will help improve the condition of your soil by loosening heavy clay soils, or providing added moisture retention to sandy soils. EKO LAWN TOP DRESSING contains nutrients which will add growth and greening to your turf. EKO LAWN TOP DRESSING works by restoring organic matter to the soil. Organic matter improves soil structure, helping to develop strong, healthy root systems. It adds billions of beneficial microbes that make available nutrients, while buffering the acid/alkaline balance of the soil.